Dance as an art is one of the durable strands interwoven into our life as a people to form the fabric of culture. Dance has existed since man came into being. It is through dance movements that people can communicate for it has been a strong factor in the expression of one's soul and identity of character. It is also through dance that people can express their joys and sorrows as well as their ideals and aspirations in life. 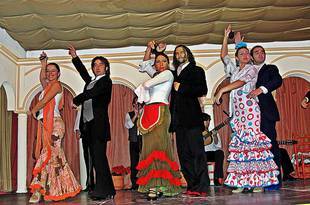 Some of the folk dances with Spanish influence are Estudiantina, Mazurka Boholana, Mazurka Mindorena and Polka sa Nayon. Among these, you will learn how to dance the last two dances, the Mazurka Mindorenaand Polka sa Nayon. Dancing was considered a religious activity among the early Filipinos. Dances were performed by the priests and priestesses in thanksgiving for a plentiful harvest, a victorious battle, a prosperous voyage or recovery from sickness. During the Spanish regime, dancing played an important part in the social activity of the people. Among the Christianized Filipino groups, the kumintangwas the oldest dance and song. It was pantomimed song and dance. The Pampangois another dance, characterized by the movements of the lion and clapping of the hands. These dances were set aside with the coming of the Spaniards, but were later revived as new dances such as the fandango, lanceros, rigodon, carinosaand curachawere introduced by the Spaniards. The folk dances of today were adaptations of the old native dances. The dances below were also some of the folk dances with Spanish influence not only with their movements and with the dance steps, but also with the costumes and music used in every dance. Estudiantina - this is a lively dance which originates from Unisan, Quezon province (formerly Tayabas). During the olden days, this dance was a favorite in social gatherings and was usually performed by young men and women who were estudiantesby the barrio folks and the girls, estudiantinas. This dance was, therefore, named after the latter. It was usually performed with accompaniment of a flute and a guitar. Mazurka Boholana -this tradional bottom dance was popular in Bohol and in other provinces during the Spanish time. This was originally performed with couples scattered informally about the room with no definite sequence of steps and direction followed. Mazurka Mindorena -this beautiful festival dance from Mindoro was the premiere dance of the high society of Mindoro during the Spanish period. Don Antonio Luna, considered one of the best dancers of his time, was responsible for preserving and popularizing this dance in the province of Mindoro. Polka sa Nayon -this ballroom polka was popular in the province of Batangas during the Spanish time. It was usually danced during town fiestas and in big social affairs.